The Paradise Papers linked Wilbur Ross to a Russian energy company partly owned by President Vladimir Putin's son-in-law. 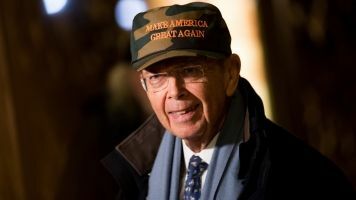 The spotlight is on U.S. Secretary of Commerce Wilbur Ross after the so-called Paradise Papers highlighted his connection with a Russian energy company. On Sunday, dozens of news outlets started publishing investigations linked to more than 13 million leaked files known as the Paradise Papers. One of those investigations revealed Ross owns a stake in a shipping company called Navigator Holdings through an offshore entity. One of Navigator's customers is a gas and petrochemicals company owned in part by Putin's son-in-law and a sanctioned Russian oligarch. Ross responded, saying he did disclose his connection to that shipping firm, and Navigator is listed multiple times in his public financial disclosure report. It was submitted to the government after then-president-elect Donald Trump nominated Ross to lead the Commerce Department. Ross told CNBC, "A company not under sanction is just like any other company, period. It was a normal commercial relationship and one that I had nothing to do with the creation of, and do not know the shareholders who were apparently sanctioned at some later point in time." The Department of Commerce confirmed Ross "recuses himself from matters focused on transoceanic shipping vessels." It also noted the secretary has supported the Trump administration's sanctions against Russia. It's unknown what ramifications — if any — Ross will face because of this connection with Navigator. After all, using offshore trusts doesn't automatically mean something is illegal. But after last year's Panama Papers, some world leaders faced serious consequences. The prime ministers of both Pakistan and Iceland were booted from office after the papers alleged both men weren't disclosing all of their finances to their respective governments.